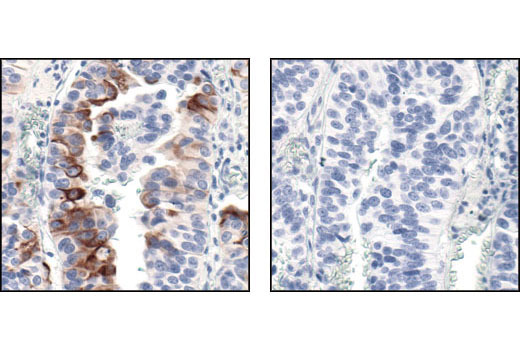 Immunohistochemical analysis of paraffin-embedded human transitional epithelial carcinoma of the bladder using Phospho-mTOR (Ser2448) (49F9) Rabbit mAb (IHC Specific) in the presence of control peptide (left) or Phospho-mTOR (Ser 2448) Blocking Peptide #1230 (right). 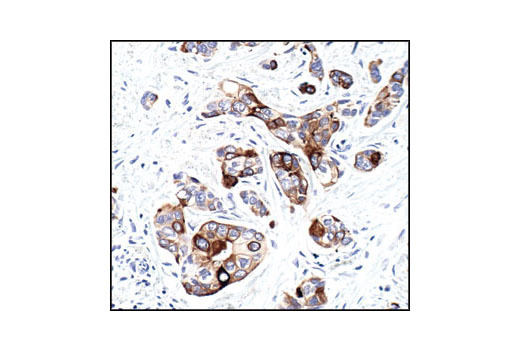 Immunohistochemical analysis of paraffin-embedded human breast carcinoma, using Phospho-mTOR (Ser2448) (49F9) Rabbit mAb (IHC Specific). 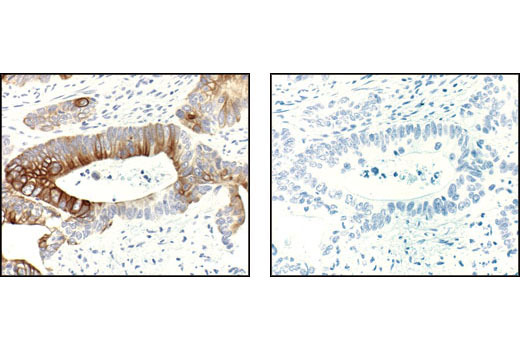 Immunohistochemical analysis of paraffin-embedded human colon carcinoma untreated (left) or lambda phosphatase-treated (right), using Phospho-mTOR (Ser2448) (49F9) Rabbit mAb (IHC Specific). 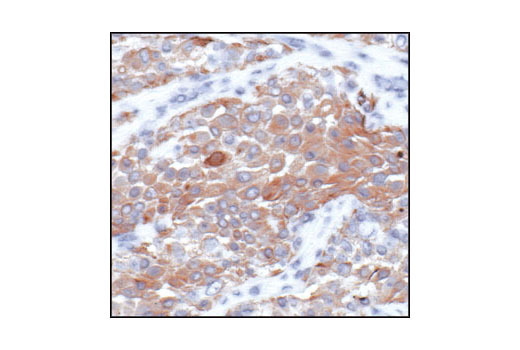 Immunohistochemical analysis of frozen H1650 xenograft, showing cytoplasmic localization, using Phospho-mTOR (Ser2448) (49F9) Rabbit mAb (IHC specific). Fix sections in cold acetone for 10 min at -20°C. Air dry. Proceed with staining procedure immediately (Section D). Phospho-mTOR (Ser2448) (49F9) Rabbit mAb detects endogenous levels of mTOR protein only when phosphorylated at Ser2448. Monoclonal antibody is produced by immunizing animals with a synthetic phosphopeptide corresponding to residues surrounding Ser2448 of human mTOR.